Summer. It’s hot, the beaches are crowded, the traffic horrendous. And the humidity is a killer. We wanted to go away for a break but really did not want to face the heat and the crowds. 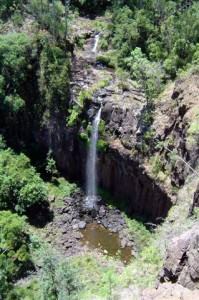 When John suggested Queen Mary Falls my first thought was “where?” 209 kilometres (130 miles) southwest of Brisbane, on the western slopes of the Great Dividing Range, it is one of Queensland’s nicest little secrets. Low humidity, no crowds, no traffic, and lots of peace and quiet; I was won over before we’d even hitched up the caravan! 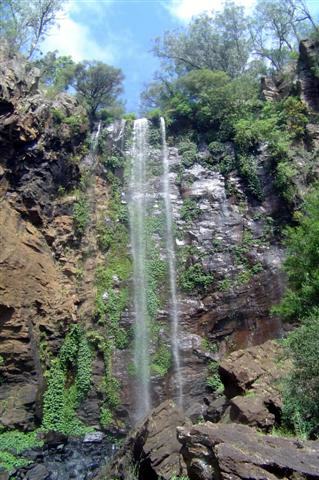 The Queen Mary Falls National Park is an area of stunning rainforest and magnificent waterfalls, the perfect place for rest and relaxation and to re-charge your batteries in a natural bush setting with an abundance of native bird life. So we packed up the caravan, loaded young son, Sean, his new pet mouse, and our little dog, BJ, into the car and set off to escape the heat and humidity of the coast and explore this wonderland of beauty on our northern doorstep. We set off at 6:00 in the morning and already it was hot and steamy. Our journey took us through Gloucester and Walcha, where we stopped for a late breakfast and to let BJ do what little dogs have to do, and then it was on to Glen Innes, one of the major communities of the Northern New England region of New South Wales. We found what was probably the only bit of shade around at a park beside the road and stopped there for lunch. BJ found it all very interesting, to say the least, and was quite happy to have a run after being couped up in the car for several hours. The mouse also made a brief appearance for some fresh air. Refreshed and replenished after lunch, we continued on our way towards Tenterfield, birthplace of the late entertainer Peter Allen. 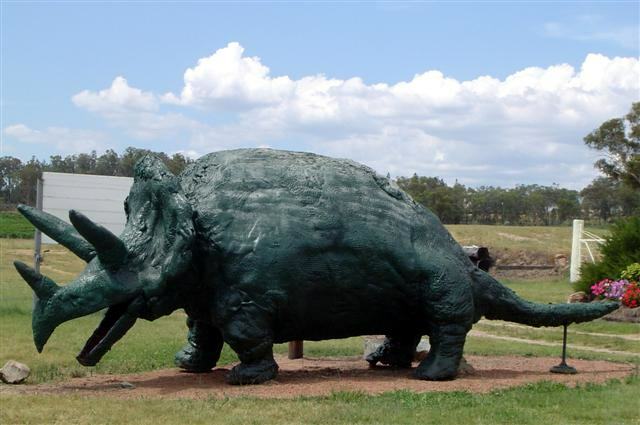 There is a significant portion of Australia’s natural history to be found in Tenterfield but exploring this interesting little town would have to wait for another time. Not long after leaving Tenterfield behind we crossed over the border into Queensland. Crossing the border we gained an hour because of the time difference and as far as Sean was concerned, it was lunchtime again. We stopped for a coffee and, for Sean, a snack (where does he put it all!) at the border and then later we had what the bus companies call a “comfort stop” in Ballandean where we met the resident dinosaur, Triceratops. Made from a papier maché type substance, it held pride of place in a small park near the railway station. John and Sean wanted a walk around and to stretch their legs and we took BJ for a little walk. He wandered around, and under, the dinosaur but it was all too much, I think, and he soon wandered back to the car. 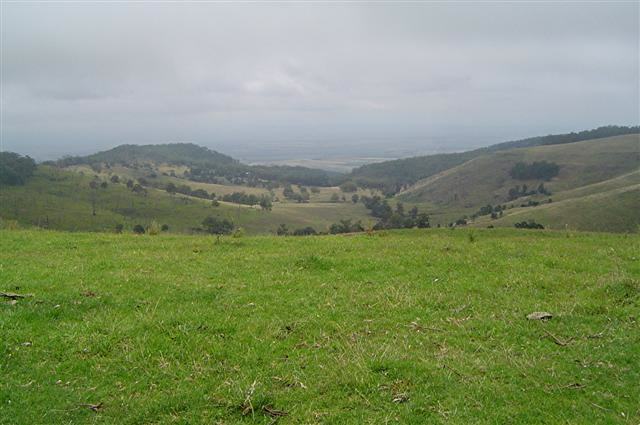 Ballandean is where Queensland’s first commercially grown grapes were first harvested. Then, in 1970, the wine industry came along and the rest is history. Today, there are some 52 vineyards in and around Ballandean. Back on the road we set off for Warwick, the rodeo capital of Queensland, and then on to Killarney, some 34 kilometres (21 miles) southeast of Warwick. In Killarney we crossed the Condamine River and then it was only another 11 kilometres (7 miles) to Queen Mary Falls Caravan Park ([star][star][star]) just across the road from the Queen Mary Falls National Park. It was late afternoon when we arrived and with our choice of campsite and we opted for one reasonably close to the amenities. All the sites are grassed and quite big, and there are plenty of shade trees around. Well, our annex went up, followed by Sean’s tent, and by then a breeze that sprung up to mute the heat of the day a little. So, with the camp all set up and the awning rolled out we settled down with a glass of wine and a soft drink for Sean while we watched the sunset. We had been warned that even in the summer the evenings could be cool here and this one certainly was that. It’s summer, it’s hot! So, who packs a sweater? John, of course, and Sean and I shivered. It wasn’t long before we adjourned to the annex for dinner and after such a long day we were soon in bed, lulled to sleep by the soft sounds of the insects and birds all around us. Our first morning was absolutely sparkling, the sun shining through the trees and not a cloud in the sky. Perfect. And hot. We didn’t expect this kind of heat here but there was no humidity so it wasn’t too bad. But little dogs need to do what little dogs need to do and so we drove down to the Browns Falls picnic ground, only a few short kilometres back towards Killarney. This is the only place close to the national park where BJ can run leash-free. The falls are a 20-minute walk entailing a creek crossing and lots of rock hopping. The road bridge over the creek was built in 1934 and is possibly the earliest curved bridge built in Queensland. We let BJ run and play for a while and he enjoyed rolling in the grass. 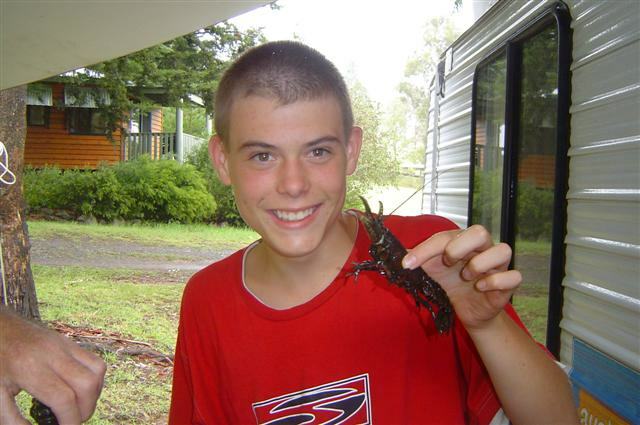 John and Sean discovered that there were yabbies (freshwater crayfish) in the creek and made plans to come back later and catch some. Oh joy! A little further on up the mountain is Daggs Falls and we stopped there for a while, taking the short walk to the first viewing platform for a photograph. 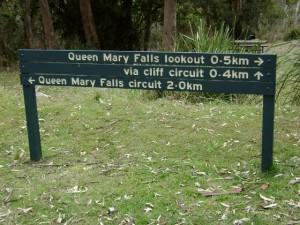 There are several other walking tracks, including a couple that go right to the falls. This is a very popular picnic area with its barbecue facilities and amenities. And there is an abundance of bird life. It was cooler among the trees and the whole place was alive with the calls of all the different birds. The temperature was still climbing and I did wonder just how hot it could get here! The park had started to fill up by the time we got back, there were caravans and camper trailers all over the place but we got the feeling that most of them were only here for the overnight stop before continuing on with their journey. A shame really because there is so much to see here and it’s all beautiful. After lunch we drove up Spring Creek Road to Carr’s Lookout. We’d been told that the view from there was outstanding but heavy fog rolled in and we could hardly see each other, much less any thing else! And so we returned to camp a little disappointed but what can you do about the weather? It was only later that we really had a reason to complain about the weather. The thunder rolled and the lightning lit up the sky! Sitting under the awning we watched the storm clouds roll in. We could hear the thunder rolling in the distance and it was getting closer. A few flashes of lightning lit up the sky and we beat a hasty retreat to the shelter of our annex. And then the rain started. The thunder and the lightning raged overhead and the rain poured down unrelentingly. The wind picked up and even though we were in a reasonably sheltered place it was still very strong. It was the start of a wild old night and I wasn’t too sure about letting Sean sleep in his tent. But the “I’m 15 years old, stop treating me like a child” wail saw me agreeing, reluctantly, to him sleeping out there. There was also the thought that the mouse would have to share the caravan with us and BJ. That was a huge factor in my agreement! All I can say is it’s a good thing BJ is a dog and not a cat! But worse was to come because the power went out. We were lucky, we had camp lights and a gas stove, but others in the park didn’t fare so well. I think, for some, it was going to be a long night. We were woken just after midnight by the unmistakable sound of a tree branch coming down. A big tree branch. But it was well away from the camping area and no one was hurt by it. It really was a wild old night and we learned the next morning just how bad the storm had been. Killarney had been hit very hard with houses unroofed, trees uprooted, and even a shipping container blown over on its side! The power station had been hit by lightning, that explained the power loss, but worse than that, we had no water. Queen Mary Falls Caravan Park uses an electric pump for its water supply. No power meant no pump. And no pump meant no water. No drinking water, no showers, no flushing toilets, nothing. Our caravan’s water tank was full so for drinking water and enough for personal hygiene we were ok but the only toilet facilities available were those in the National Park. Not the best of situations but we were promised that the power would be back on in a few hours. John wanted to do the Condamine Gorge 14 River Crossing where the Condamine River twists and turns so much that when you drive through the gorge you actually cross it 14 times! We’d been advised that under normal conditions the crossings were relatively shallow but after last night’s storm we expected that the river would be up a little. 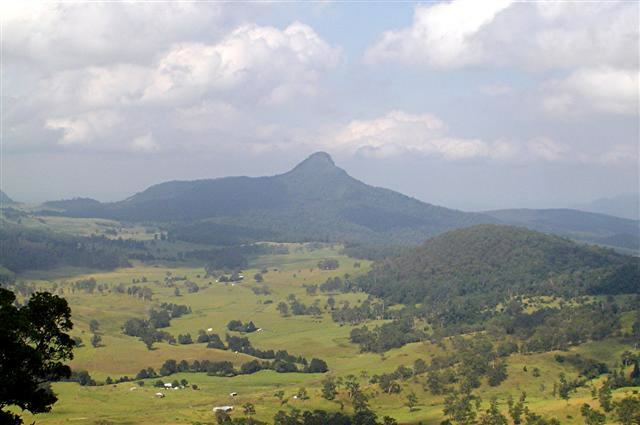 We set off down Spring Creek Road towards Boonah until we reached Condamine Gorge Road. 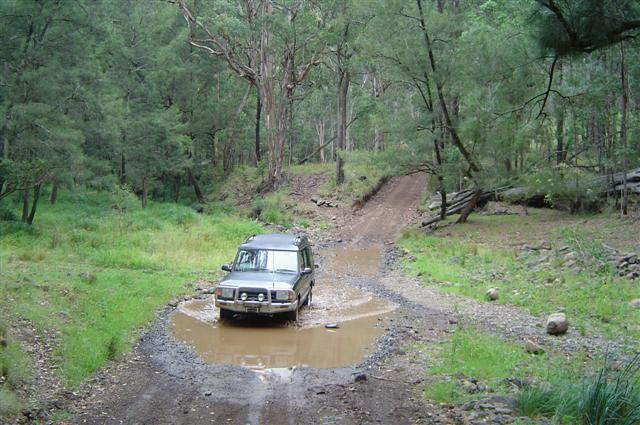 The sign proclaimed “Dry Weather Access Only for 2wd Vehicles”. The skies were still very overcast and I thought we might be in for some more rain but we turned onto the road and started down the track, stopping about a kilometre in for a photo. But the river was mostly dry! 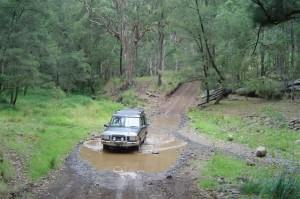 newcomers to off-road trips who want to try river crossings this track is great. It’s not difficult and the actual river crossings are easy unless there has been a lot of rain. In the pioneer days bullock teams hauled the timber logs along this road. Back then there were 15 river crossings but one is off the main track now and each one of them is named. 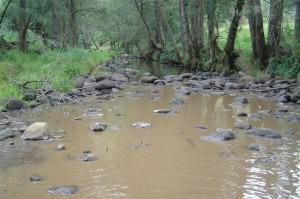 We were a little disappointed with the river crossings that day and I certainly needn’t have worried about the rain. There had been precious little rain to speak of in recent months and the river was mostly dry. The previous night’s rain, heavy as it was, made that once mighty river little more than a puddle in some places. Still, we pressed on and along the way passed a few places that would have been good for a picnic. Nice, grassy areas right on the riverbank. We did stop for a quick coffee before continuing on to the next crossing. It was very peaceful and there were some birds calling although I’m not sure what sort of birds they were. BJ enjoyed a little run until he came to something he wasn’t expecting. Neither were we for that matter; a small wallaby jumped up in the bushes and my brave little guard dog ran and hid behind John’s legs! We continued on from there and crossed the river a few more times. We were almost to the end of the track and the road was starting to get a little wider. It was also almost lunchtime, as Sean kept reminding us, and so we decided to go on back to camp. There was still no power when we arrived and it appeared that it would be some time before it was restored and so after a quick bite to eat we took off for Killarney where our first stop would be the public restrooms! From Killarney we drove north out to the little town of Tannymorel and from there started our climb up Mt. Colliery towards Sunday Plains. It was absolutely beautiful countryside all around us as we bumped our way along the road and it wasn’t long before we reach what we took to be the summit. The view out over Killarney was outstanding, even if it was still overcast without a hint of sunshine. The little town of Killarney in the distance made us realise just how high up we had come but the view was breathtaking. It was also quite cool up there so we didn’t linger. John wanted to see where the road would take us so we continued on until we came to a magnificent pine forest. The gate was open and, as an open gate is an open invitation to an off-roader like John, we decided to have a drive through the trees. The pine trees, all in straight lines like sentries, towered over us, their magnificent foliage such a marvellous deep green. There were warning signs about the logging and we kept an eye out for the trucks but saw none. John stopped the car and we went for a little walk, enjoying the soft carpet of pine needles beneath our shoes. For some reason we spoke in hushed voices and even BJ seemed to sense that there was a reverence about this place. And the fragrance of the pines was all around us, wafting delicately on the breeze. It truly had an impact on our senses and even now, if I close my eyes, I can feel those pine needles and smell their perfume, and be transported once again to that tranquil place. We were leaving the pine forest when a thick bank of low cloud rolled in making it hard to see the road. It was starting to get late anyway so we decided to head back to camp. The power still hadn’t been restored but we were assured that they were working on it. Luckily the national park restrooms were just across the road. We sat down to dinner by torchlight and it wasn’t until almost 9:00 that night that the power came back on, some 24 hours after it had first gone out. We immediately made a beeline for the amenities but it seemed that everyone else in the park had the same idea and there was quite a line for the showers. So it was very late that night when we finally fell into bed; the wind was blowing hard but it didn’t bother us and we were soon deep in the land of nod. starting to climb. What a glorious morning! The birds in the trees were all in full song and the air smelled fresh and clean. It’s amazing what a bit of rain can do. After breakfast we again drove down to Browns Falls picnic ground to let BJ have a run with Sean; he loves to roll in the grass (BJ not Sean) but we’d planned a walk through the rainforest and a visit to the mighty Queen Mary Falls today so we didn’t stay too long there. Queen Mary Falls is inside the national park so BJ couldn’t come with us. It was decided that John and Sean would make the trek to the Falls while I waited at camp and then John and I would go this afternoon. The day had become quite hot and when the boys returned, about lunchtime, they were dripping wet. But how they got wet was the big question. There are no swimming pools close by and, as we’d seen the day before, the Condamine River is not deep enough for swimming. 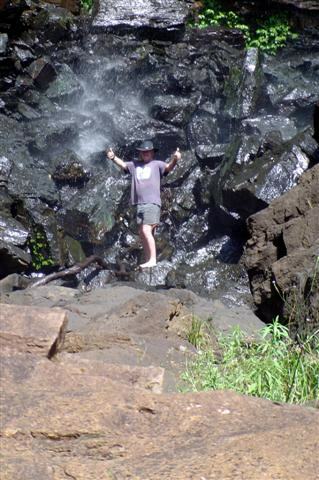 Well, it seems that they left the path and climbed over the rocks at the base of the falls and stood under the waterfall! It must be a boy thing! We had a quick bite to eat and John and I set off for the national park and the centrepiece of this beautiful rainforest, the Queen Mary Falls. The path was steep in some parts, slippery in others but, on the whole, quite easy to navigate and it didn’t take us long to reach the bottom. This pocket of rainforest on the valley floor is a sharp contrast to the eucalypt forests on the upper slopes of the mountain range. Spring Creek winds its way through the park before plunging over the 40-metre (131-foot) drop that is Queen Mary Falls. The water flows all year round but the lack of any decent rain has reduced the volume considerably. The Falls are, of course, named for Queen Mary. It is said that she visited here as a child, was brought here on horseback. However, there is no evidence to support this story but, then again, there is nothing to disprove it either. he scrambled over the rocks to stand under the Falls. I shook my head in bewilderment at his antics but the weather was hot and, if truth be told, I was envious and more than a little disappointed that I couldn’t join him! We now had to begin our upward climb. There were some seats strategically placed along the way for those who need them. It may only be a short climb but it is steep. The complete circuit is only 2 kilometres (1.2 miles) but we weren’t in any hurry and it was really quite pleasant in the rainforest. We’d been told to keep an eye out for wildlife but the only things we saw were lizards and skinks. The falls are quite spectacular when the area has had its normal amount of rain but the drought has meant that they are not quite as majestic as they usually are. We continued our walk up to the top and soon were back at the park entrance. There seemed to be an awful lot of birds around the front entrance of the caravan park and we soon found out why. Native birds, particularly the Australian King Parrot and Crimson Rosella, can be hand-fed here. There were a lot of children trying to entice the birds onto their shoulders with food. The birds were calling and screeching and mixed with the laughter and squeals from the kids the noise was deafening. or so yabbies. It had been a good afternoon for all of us. Except the yabbies, that is. We woke the next morning to overcast skies and cool winds; it looked like rain wasn’t too far off. We’d wanted to see Teviot Falls and then drive down the mountain today but if it was raining we wouldn’t be seeing much. But it looked like it might clear so we took the chance and off we went. We set off up Spring Creek Road towards the Condamine River Gorge and followed the narrow and winding road through to Teviot Falls. On the way we stopped to have a look at Wilson’s Peak with its rather unusual knob on top. Most of the view was shrouded in low cloud but it did clear slightly for a while. 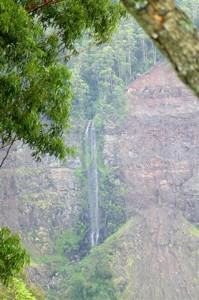 The best place to view Teviot Falls is at a 90° right angle bend in the road and we pulled off onto the road shoulder. This was as close as we could get to the falls. We’ve been told that there is a path around the top but it crosses private property. Again, there wasn’t much water and we could see at the bottom of the falls the rocks that are usually submerged. I don’t like this road! exaggeration there . . . but only slight) and it twisted and turned and wound around sharp corners all the way to the bottom. John and Sean were having a great time but I was hanging on for dear life! It was only a 40-kph (25-mph) speed limit and John certainly didn’t exceed it but it was still way too fast for me! Then the inevitable happened. There is always one fruitcake isn’t there. About halfway down we caught up to . . . you guessed it . . . a car towing a big caravan! How he got around some of those corners just amazed me and I’m sure he came close to losing his mirrors a few times. There was no way we could get past him so we sat behind him as he rode his brake pedal down the incline. Finally we reached a place where he could pull over and we scooted past him but the smell of burning brake pads stayed in our nostrils for quite a while after. At the bottom we came to a few scattered farms and little else. The road had come to a T-intersection and, with no signposts to guide us we flipped a coin to decide whether we turned left or right. The right won. It was beautiful countryside, a lot of cattle around, and huge fields of lush green grass, but still no signposts. Finally we saw a farmer in his tractor so we stopped to ask where we were. Well, at some point we had actually crossed over the border and we were in New South Wales! The farmer told us which way to go, we thanked him, and were on our way again. We have no idea when we went back over the border into Queensland but it was when we saw the rabbit sign that we knew we were there. In this part of Queensland there has been a plague of rabbits and so it is now against the law to keep them, even as pets. We stopped along the road to let BJ have a run and to have our picnic lunch and then continued on to the place they call The Head. There was a fine sprinkle of rain falling but we decided to go on and see where this road would take us. 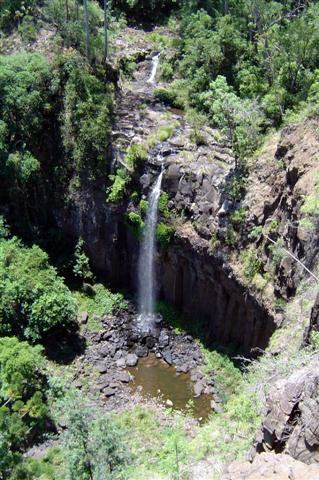 friendly resort set in the spectacular Condamine Gorge. Several cabins are set in the rainforest and unless you know exactly where to look, you can’t see them. There is no electricity there, only 12-volt lighting and gas hot water, fridge, and stove. The perfect place if you want to literally get away from it all! We spoke briefly to the caretaker before having a drive around the area and he told us that this part of the Condamine River is a habitat for platypus and that if we were lucky we might see one. Well, unfortunately we weren’t that lucky although, believe me, we did look. And so, we came to our last day at Queen Mary Falls. The rain had cleared and the winds had dropped but there were still a few clouds. We didn’t want to go too far afield this day so decided to have another look at Carrs Lookout and hope there was no fog this time. It wasn’t until mid-afternoon that we drove up Spring Creek Road to the lookout and by that time there was a lot of low cloud over the mountains. 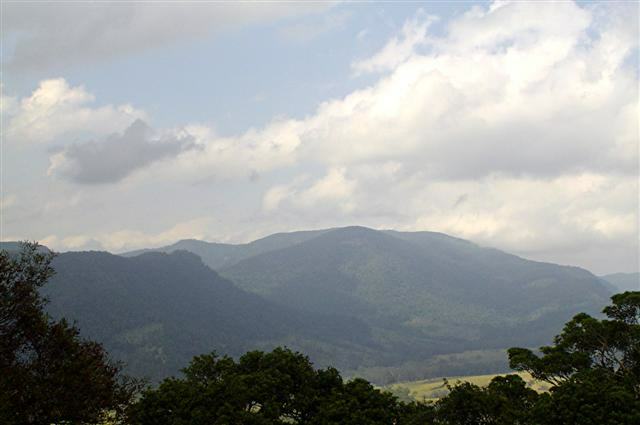 The view from the lookout takes in the entire Head Valley with Wilson’s Peak, Mt Superbus, and Mt Barney in the distance. We parked the car at the top of the road near the Spring Creek Café and walked down to Carrs Lookout. There is a plaque at the lookout with a little of the history of the area. One particular item stood out. “On April 8th, 1955 an RAAF Lincoln crashed on Mt Superbus. The plane had been on a mercy dash from Townsville to Brisbane with a sick baby. All 11 on board were killed and the only survivor was a dog.” It went on to mention that it took several days for rescuers to reach the crash site because of the rough terrain. A little further on from the lookout are the Moss Gardens. These are trees draped in different types of moss and the rocks are carpeted with green moss. We thought we might go and have a look but it started to rain and that dampened our enthusiasm (pun intended). And so it was back to camp but by the time we got there the rain was coming down in buckets. It wasn’t the best end to our break at Queen Mary Falls but, in spite of the inclement weather, we’d still had a great time. 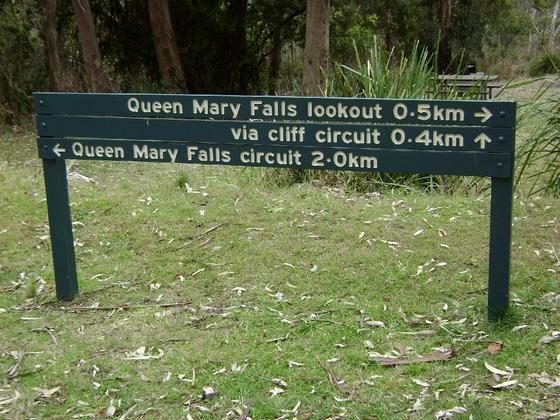 We found Queen Mary Falls to be a delightful surprise and we’re sure you will too.